Lois A. Nail Brice, daughter of James Monroe Nail and Annie Lee Baker, married to Lee L. Brice and buried in National Memorial Cemetery of Arizona, Phoenix, Maricopa County, Arizona. Lois Brice, a longtime resident of Payson, Ariz., passed away after a short illness, surrounded by her loved ones. 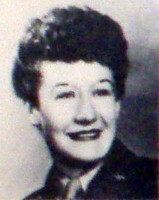 Born on Feb. 19, 1919 in Bronte, Texas, she served with honors in the Women’s Air Corps during World War II. She was honorably discharged in 1945, returned to Texas where she earned her bachelor’s of education degree and then her master’s degree in social work. An excellent seamstress, she quilted special blankets that the police department gave to traumatized children. She loved to cook and gifted family, friends and neighbors with jams, jellies and baked goods. She was previously president and longtime member of the Payson Womans Club. She leaves behind many friends and memories. Her smile could light up the room and she had a way of making everyone feel welcome. She is survived by her children, Linda (John) Brown, Lana Andersen, Lindsay Bowers and Adam Brice; her grandchildren, Timberle Gobin, Shannon Magee, Mitzi Beaty, Reagon Wishart and Truett Anderson; and 11 great-grandchildren. Mrs. Brice was preceded in death by her husband of 50 years, Lee Brice. A special memorial service will be held at 2 p.m., Saturday, Dec. 17 at Messinger Payson Funeral Home, 901 S. Westerly Rd., Payson.